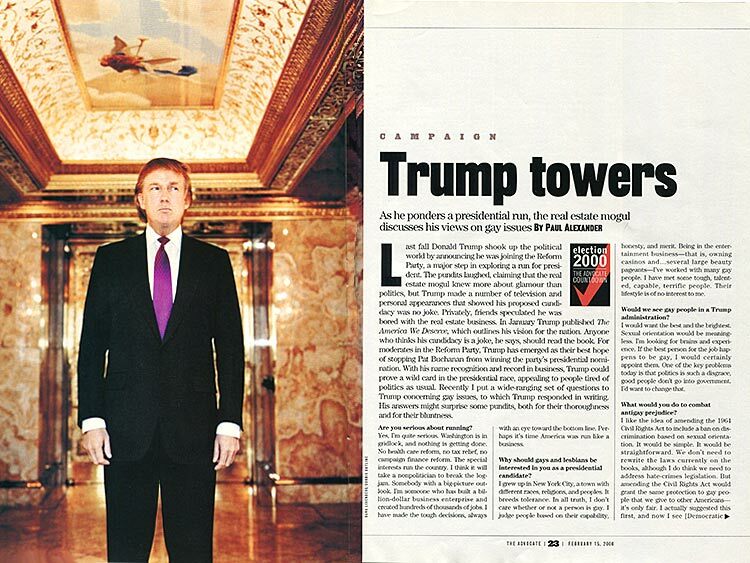 When he ran for president 15 years ago, the real estate mogul sang a different tune when it came to minorities. Read the entire Q&A from 2000 below. I would want the best and brightest. Sexual orientation would be meaningless. I’m looking for brains and experience. If the best person for the job happens to be gay, I would certainly appoint them. One of the key problems today is that politics is such a disgrace, good people don't go into government. I’d want to change that. Everyone makes a personal choice. Look, it just doesn’t matter to me. I try to treat everybody equal and fairly. Maybe that's why I can count men like Muhammad Ali, Joe Frazier, and Sammy Sosa as my friends. When you hang with people who are different from you, you get an appreciation for other cultures. Do you think you will ever marry again? My life is an open book. I am a good son. I am a good parent. I’ve got four wonderful kids. I’ve been married twice. I don’t smoke. I’ve never had a glass of alcohol. I’ve never taken illegal drugs of any kind. I’ve never even had a cup of coffee. I admire women, I respect women, and I love beautiful women. Hey, I’m single. I’m allowed. If the Clinton thing showed anything, it was that people care more about whether you can do the job than your personal life. Some people say Clinton might have been better off if he’d been caught with a supermodel, but I don’t know. I think the institution of marriage should be between a man and a woman. I do favor a very strong domestic-partnership law that guarantees gay people the same legal protections and rights as married people. I think it’s important for gay couples who are committed to each other to not be hassled when it comes to inheritance, insurance benefits, and other simple everyday rights. Do you think gay people should be allowed to serve in the military? Yes, if a gay person can be a doctor or a lawyer or a teacher or take another position of responsibility, why can't they serve this country in the military? “Don’t ask, don’t tell” has clearly failed. Gay people serve effectively in the military in a number of European countries. There is no reason why they can’t serve in the United States. Frankly, the state of our military is a wreck. Military pay is a joke, military benefits are ridiculous, and we can’t attract the kind of quality people we need to have an effective fighting force. The Pentagon is wasting millions on weapons they don’t need instead of focusing on the military needs in the changing world situation. The truth is, our nation defense is in the weakest state since Pearl Harbor. I favor a total reorganization of all branches of our military, and I would address the gay question more forthrightly within that reorganization. Are you running just to beat Pat Buchanan? I used to like Pat. I was on Crossfire with him. I thought he was a nice guy. Then I read the things he had written about Hitler, Jews, blacks, gays, and Mexicans. I mean, I think it’s disgusting. That speech he made at the ’92 Republican convention was a disaster. He wants to divide Americans. Clearly, he has a love affair with Adolf Hitler, and that’s sick. Buchanan actually said gay people had chosen “satan[ism] and suicide.” Now he says he welcomes gay people into his campaign. The guy is a hypocrite. If you wanted to accomplish four things as president, what would they be? My number 1 goal would be to make our economy boom. My plan to impose a onetime net worth tax of 14.25% on the superwealthy, when combined with our current projected surpluses, will raise enough to pay off the national debt. That would save us $200 billion a year in interest. I’d use half the savings to cut taxes for the middle class. I’d use the other half to fund Social Security and finance a new health care system. Second, I’d like to end the rip-off of America by our allies. We pay for their defense, and they screw us with their trade policies. I would appoint myself U.S. trade representative and conduct the negotiations with our major trading partners myself ­— and I guarantee you the rip-off of America would end. Third, I would press for universal health care. It’s ridiculous that the richest country on Earth can’t provide first-rate health care for our people. I would put forward a comprehensive health care program and fund it with an increase in corporate taxes. I’d strictly regulate the pharmaceutical firms to end these 500% profits on drugs that are cheap to produce. I like the Canadian system, although their health care is not the best. If you combine their system with the quality of our health care, we could provide cradle-to-grave health care for everyone. Last, I’d like to restore the spirit of America. I don't think we’ve had the American spirit much in recent years. The last leader to inspire confidence and build the American spirit was Ronald Reagan. I don’t agree with everything he did, but I agree with a lot — and I have to admit, I liked his style. I also want to see a greater atmosphere of tolerance. The dragging death of James Byrd in Texas or the murder of Matthew Shepard in Wyoming is a national disgrace. We must have a more tolerant society. How did you feel when you heard about the Shepard murder? It turned my stomach. I have a son who is about the same age as Matthew Shepard and is a student at Wharton. The idea somebody would beat a young man to death just because he is different is almost hard to fathom. I hope that the boy’s death is not in vain and that the public revulsion about this case can be harnessed in a way that prevents this kind of hideous crime from happening again. Bush had refused to meet with the Log Cabin Republicans. Would you meet with groups advocating gay rights, such as the Human Rights Campaign? If I decide to run, I would meet with any law-abiding group representing legitimate public interests. I remember when Bob Dole refused a campaign contribution from the Log Cabin Republicans in order to pander to the religious right — a big mistake. Now I think Governor Bush is making the same mistake. If I run, my campaign would be inclusive, and I would reach out to everyone. I'll make that decison at the end of February. My people have begun collecting signatures to preserve all my options to get on the ballot. Maybe not. I believe in straight talk. Maybe I’m too blunt for politics, but I’m not about to change. Unlike the rest of the people running, I’m not some pol trying to top out his resume. I don’t need the job to feel good about myself. In fact, I feel pretty good right now. But I guarantee you this. If I do run, it won’t be boring. Alexander is a political columnist for Bloomberg News. He has contributed to Rolling Stone, Mirabella, and The New York Times Magazine.